With a wireless router, a consumer focus is likely to be on the type and level of networking performance the device is designed to deliver. With this fundamental idea in mind, our Linksys WRT1900ACS review has been created. If you are just one of the few consumers who always crave best-in-class performance from a networking device, this router can easily emerge as an unmatched tool that delivers promised user experience as well as superb Wi-Fi coverage. Read on our Linksys wrt1900acs review to find out more details about this fast, wonderful router. Iconic is the router’s blue-black design. The router is outfitted meticulously with an up-to-date Wireless-AC platform and a state-of-the-art four antenna configuration. The 1.2GHz dual-core ARM can provide extremely consistent signal strength while ranging to support more than one user quite simultaneously. The router also comes with a uniquely designed USB 3.0 and dual eSATA/USB 2.0 port, so the device can conveniently connect a good number of different devices. So, you can receive blaze-fast transfer speeds even though you use multiple devices simultaneously. Another feature that is worth considering is its SMART Wi-Fi software that gives users an exclusive opportunity to consistently monitor and control their networks all the way anytime. The router offers a networking tool called Network Map smart tool that provides users with a quick and view of their entire networks. Some users feel an interest in customizing their firmware. If you are an advanced user with the same interest and you want your firmware customized, the router offers firmware that compatible with OpenWRT. The firmware will let you expand the overall strength of your router to an extended degree. Thus, the WRT1900AC easily stays live and true to the commitment of its lineage. What makes the Linksys WRT1900ACS a powerful device? 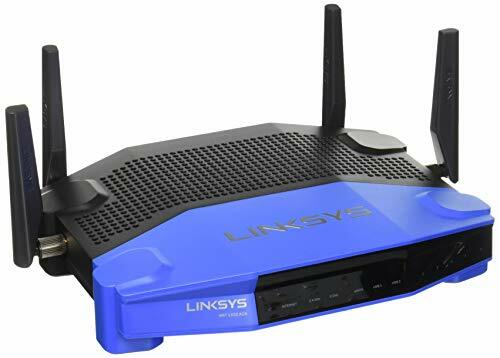 The very first thing that will come to any user’s notice is the Linksys WRT1900ACS router’s four antennas which are carefully engineered to ensure maximum reliability and coverage. The antennas are adjustable and externally integrated. These antennas are attached to ensure that the Wi-Fi signal always remains at its maximum strength so that multiple users can keep gaming, streaming or downloading without any distraction. Added to the handful of features is a 1.2 GHz dual-core ARM CPU which is easy of an above average grade. The CPU enables the transfer of data at incredible rates even though you use it in the busiest and most congested networks. The router intelligently leverages the Wireless-AC standard to deliver the Beamforming technology. Instead of sending out Wi-Fi signal in a simple or one-way direction, the router is capable of sending out the signal to a specific number of devices. So, the most obvious perks include improved Wi-Fi connections, extended wireless range, faster network speeds and a reduced amount of interference yielded from other devices. Another enjoyable advantage that the router delivers is its capability to offer the most advanced and convenient wired connections. The four Ethernet ports are at least 10 times more stable and faster than what you may call a Fast Ethernet. If you need to use the device for a desktop PC that oftentimes needs a wired connection, you will admire its speeds. The USB 3.0 port will allow you to add an external storage or device to share your content across the network. Strong Wi-Fi signal, wide coverage with high speeds. Supports USB 3.0 and it has even an eSATA port. It has a unique and atractive design. Some people may not like the design. In this Linksys WRT1900ACS Review we will also present all it's features. This will permit you to connect a Hard-Drive to your router and share files with other users sharing the connection and it will feel like having your own personal Cloud for sharing pictures, music or even movies. Imagine all the members of your home building a habit of sending all of their digital photos onto the hard-drive to be reviewed at the end of the year. This allows you to connect to your home router from another place accessing files and having control over what happens. This comes in handy for a Smart Homeowner. This app allows you to see who's connected, how much speed they are using and best of all can limit their usage. It will really show you what's happening with the whole network. Other options like parental control are also available. As you open the box you will find the router without the antennas mounted. Underneath you'll find the four antennas carefully placed and at the bottom of the box there's the power supply and a power supply cable, a quick start guide card that also contains a support CD and an Ethernet cable. The next thing is that the Linksys WRT1900ACS is open source ready, meaning that the additional customization layer included in the device lets users suit their individual demands regarding the use of their devices with Open-WRT. Of course, you will want to stay safe and alerted when any unauthorized individual will attempt to access your private data. The router has included an advanced security measure, so you can stay safely connected. The device requires users to initiate setup through a Wi-Fi connection. Also, it includes an SPI firewall and WPA2 encryption. You can also use the parental controls if you do not want your children to use Internet connection when you do not want them to. Although the router comes with an attractive look, you may find it a little larger. Depending on the issues experienced by many users, you may have a problem in locking it up, particularly when you are using an external drive by attaching to the router’s USB 3.0 Port. Very strongly secured with top speeds and lots of features like parental control, eSATA support for file sharing, OpenVPN and other similar features there's no doubt that this router is the perfect companion for homeowners with high internet speeds. Thanks for reading our Linksys WRT1900ACS review and I hope you found it useful.